As a member of the experimental film group Neuf I have widened my Art practice. Coming from a painting background I love using movement and sound in my short films. Neuf gives me a chance to collaborate with others in the group. We respond to the same influences in a completely different way and by showing our films together the audiences can have a wider experience. This image is from the first of our Home series. We respond in our different ways to the home we will be showing in. In this case the venue was my house . 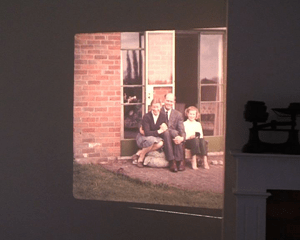 I made a film from projecting old slides on the wall of my empty childhood home after the death of my Mother.